Michael Scuse of farm and foreign agricultural services to take over Hardens's role in interim. 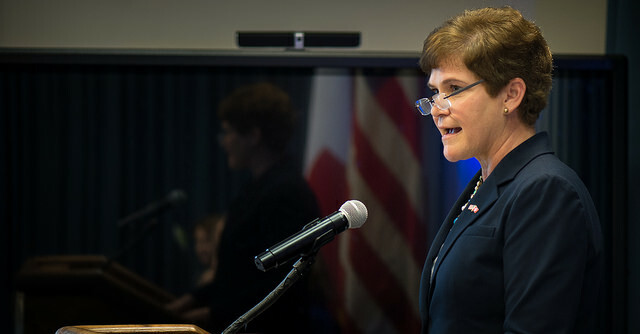 Agriculture deputy secretary Krysta Harden announced Thursday plans to depart the U.S. Department of Agriculture at the end of February 2016. Harden has been a key member of Agriculture Secretary Tom Vilsack’s team since 2009. Vilsack announced that Michael Scuse, the current undersecretary for farm and foreign agricultural services (FFAS), will serve as acting deputy secretary of agriculture. Vilsack also directed Alexis Taylor, the current deputy undersecretary for FFAS, to assume the duties of undersecretary for FFAS. After serving under agriculture secretary Tom Vilsack since 2009, under secretary Krysta Harden is resigning from her post at USDA. Harden first started at USDA as assistant secretary for congressional relations, then as Vilsack’s chief of staff and, finally, as deputy secretary, which Vilsack said “underscore her unique talents as a leader and a champion for rural America. I speak for thousands of colleagues across the USDA, the federal family and our nation's food and agriculture sector when I say she will be missed. I appreciate her service and wish her well in her future endeavors." When serving on the congressional relations team, Harden helped shepherd the Healthy, Hunger-Free Kids Act as well as secure funding to help resolve outstanding claims of discrimination by African American farmers. As deputy secretary, Harden said she was proud to lead the implementation of the 2014 farm bill. “The farm bill, like USDA, impacts every American and millions of people around the world, and I was grateful to play a small part in helping to achieve important, meaningful reforms for the future of agriculture through its implementation,” she said. Vilsack added that many have called the 2014 farm bill the best-implemented farm bill in history. “I believe that is due, in large part, to Krysta's leadership,” Vilsack said. Harden called her time at USDA the greatest honor of her professional career. “As the proud daughter of farmers and someone who cherishes rural values, I couldn't have served for anyone more genuine and committed to making a difference than Secretary Vilsack,” she said. Agricultural groups also had kind sentiments for Harden. Chip Bowling, president of the National Corn Growers Assn., said the organization has had a long relationship with Harden before and during her time at USDA. “We are sad to see her go, but we wish her well in her next chapter and hope to work with her again in the future,” he said. For more than a decade, Harden also worked in the Washington offices of the American Soybean Assn. (ASA) prior to her public service. Richard Wilkins, president of ASA and a farmer from Greenwood, Del., praised Harden’s attention to the needs of America’s farmers.